In an earlier post we saw how peer analysis can mislead. In this post we suggest a better method: distance-based peer analysis. Which Peers Are Most Similar? Among the firms in a sector, we usually note that the client firm is more like some peers than others. Important characteristics that we use to compare firms include size, volatility of earnings, and capital structure. If we wish to advise based on peer practice, it’s obviously better to weight the recommendation by the similarity of peers. It’s also useful to demonstrate how the recommendation is sensitive to the size of the peer set we’ve chosen. Identify the salient firm characteristic(s), such as Annual Revenues or Interest Coverage Ratio. Define the distance metric, which compares the salient characteristics against those of the client firm. Sort the peers by distance from the client firm. Analyze the N closest peers (for N = 1, 2, …) to determine the recommendation for the client. F5 Networks is a provider of application delivery networking (ADN) technology that optimizes the delivery of network-based applications. They currently have no debt. For this example we will use peer analysis to determine a recommended leverage level for the firm. The peer set is the S&P500 “Application Software” firms: ADBE, BMC, CA, CPWR, INTU, MSFT, ORCL, VRSN. We leave out Salesforce.com, whose current 6.0x leverage is considered an outlier, and Red Hat, which has no debt. 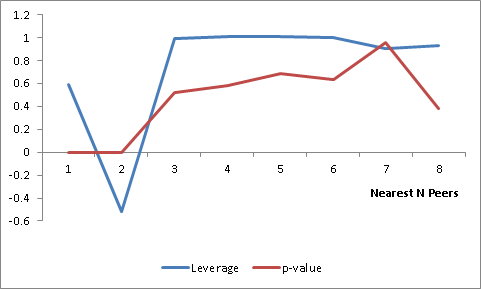 Among the peers, the mean leverage is 0.85x; the median is 0.8×0. This calculation weights all peers evenly, and thus implicitly assumes that FFIV is equally similar to all other firms in the industry. Average-based peer analysis is the simplest type. Unfortunately it also ignores important information which we can use to improve our recommendation. Optimal leverage depends on a variety of firm characteristics, such as size, volatility of sales, and profitability. For example, we expect a larger firm to have greater debt capacity. To control for these important influences, we can use regression analysis to include this information as part of our analysis. To simplify our analysis we will focus solely on size, as measured by LTM Revenue. Other characteristics (such as volatility or profitability) could be included as desired. We have a relatively small population of firms to work with. Adding or deleting just one or two firms from the peer set can dramatically change the results of quantitative analysis. Despite our intuition that larger firms have a greater debt capacity, our first regression analysis has found the opposite: leverage declines with revenue. Though counter to the expectations of tradeoff theory, this behavior is supported by the pecking order theory. For FFIV’s Revenue of 1,210, we obtain a predicted D/EBITDA of 0.93x. This is higher than the average-based values above because FFIV’s revenue is relatively low and the OLS line has negative slope. Perhaps we shouldn’t compare FFIV with MSFT: the latter is 60 times larger, and their optimal capital structures may differ. Instead we will focus on the peers most similar to FFIV. 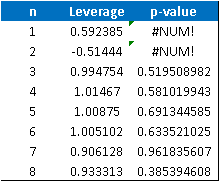 The single closest peer is CPWR; so the recommended leverage for N=1 is CPWR’s value, or 0.59x. Widening the peer group to two produces a line of best fit with a severely negative slope. (As it turns out, VRSN has both the lowest revenue and highest leverage among the peers.) Thus for N=2 we find a negative predicted leverage for FFIV. After we get through the hiccup with CPWR/VRSN, as we add peers with revenues up to $5bn we seem to stabilize on a predicted leverage around 1.0x (which is slightly above the mean leverage of 0.9x for the closest six peers). The p-value generally worsens (indicating increasing likelihood of a chance relationship) as we add ever-more-distant peers to the group. We now have quite a collection of predicted leverages for FFIV: 0.8x (average-based), 0.9x (simple regression), 0.6x (nearest peer), and 1.0x (all firms with revenues < $5bn). What is our recommendation for FFIV? We won’t answer that question today. The goal of this post is to illustrate some subtleties in peer analysis and hopefully to get you thinking about alternative ways to incorporate information from comparable firms.